American Horror Story returns for its eighth season next week, but it won’t be just any new season of Ryan Murphy horrors. Apocalypse, the long-awaited crossover between the first and third seasons, will mash up the ghostly nightmares of Murder House with the witchy magic of Coven in a whole new story about the end of the world. Before the new season returns, you probably have a few pressing questions. Like, how well do you need to know the past seasons to enjoy the new one? Who’s returning and where did they leave off? Wait, how many characters is Sarah Paulson playing? Fear not, I’ve got the answers to save you hours of rewatching. 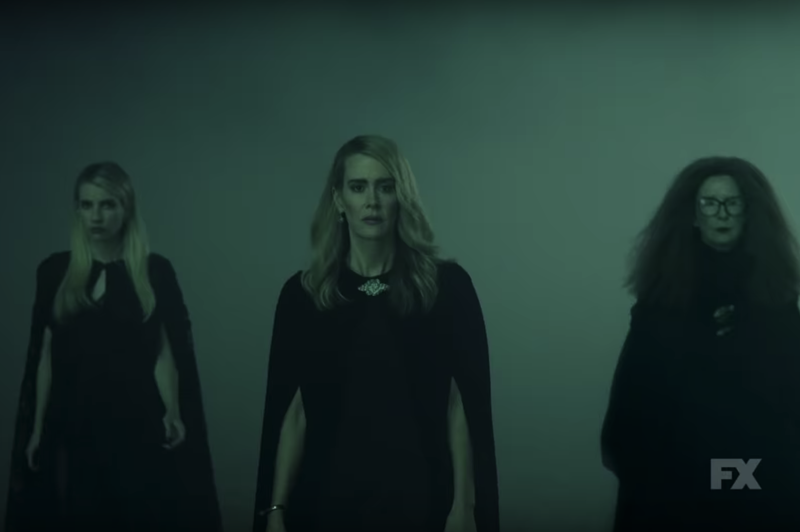 Here’s everything you need to know for AHS: Apocalypse when it returns next Wednesday. 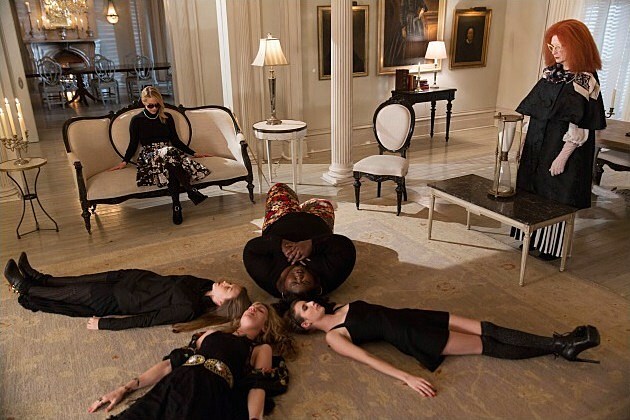 And, obviously, spoiler alert for any and everything that happens in Murder House and Coven. The plot has been largely kept under wraps, but we have some clues. We know the season is set about 18 months into the future, so roughly 2020. Executive producer Alexis Martin Woodall revealed the season will take its subtitle quite literally. “The story begins with the end of the world and then our world begins,” she said at the TCA press tour. The latest trailer revealed that after a doomsday-like event, a handful of survivors are sent to a safe house called Outpost 3, which is run by Sarah Paulson’s new character, Venable. Inside, the guests are safe from the radiation contamination (and possible cannibalism?) up above, but they’re also subjected to some freaky torture. What happens from there is a mystery, but a warning of the impending apocalypse is nothing we haven’t heard before; Sarah Paulson’s medium Billie Dead Howard teased it all the way back in Season 1. It holds the secret of the end of the world. This piece of paper reveals the precise nature of the Antichrist: a child born of human and spirit will usher in the end of times. It is the essence of evil. A perversion of the immaculate conception. And then the Antichrist was born. But as AHS jumped into other time periods and themes over the next several seasons, we never got to see the evil kid summon doomsday. That’s where Apocalypse comes in. Who Is Michael Langdon, aka the Antichrist? If you need to remember any character for Apocalypse, it’s Michael Langdon. In the first season, Vivien was raped by Tate Langdon (Evan Peters) while he was disguised in the Rubber Man suit – she thought it was her husband Ben (Dylan McDermott). Despite being a ghost, Tate somehow got Vivien pregnant with Michael, which according to Billie’s prophecy makes him the Antichrist. After Vivien died during childbirth, Constance took her grandson and raised him herself. In a flash-forward to three years later, Constance caught Michael with a big, bloody smile on his face after he murdered his nanny. In Apocalypse, we’ll meet Michael as an adult, played by Versace actor Cody Fern. The teaser revealed the very first look at the grown-up Michael, with creepy demon eyes. The only thing fishy about this is the timeline: technically Michael was born in 2011, so if the new season is set roughly a year and a half into the future, that would make Michael 9 years old. Fern is 30. So, uh, do demons age faster than humans or what? How Did Murder House End? Michael’s birth wasn’t the only major event at the end of the season. Vivien died from hemorrhaging during childbirth, but before that, she also gave birth to another child, who also died. What a fun show for the whole family, huh? Let me explain – Vivien was actually carrying twins. 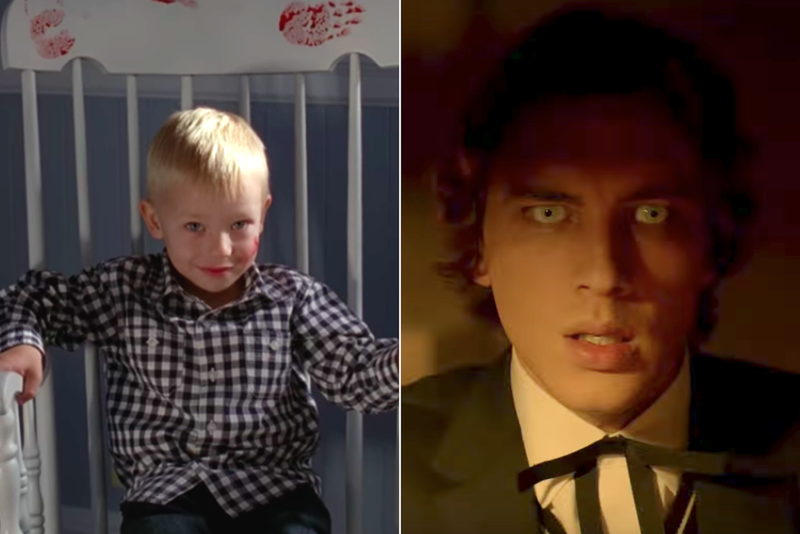 One was Tate’s Antichrist baby, the other was Ben’s child, Jeffery, who took one breath inside the house before the stillbirth, thus making him a permanent baby ghost. A jealous Hayden (Kate Mara) and some other ghosts killed Ben, so he remained a spirit with his dead wife, dead infant son, and dead daughter Violet (Taissa Farmiga). Violent killed herself by overdosing on sleeping pills when she learned her crush, Tate, was a murderer who shot up his school (and uh, also assaulted her mom). The TLDR: pretty much everyone on the show was dead by the end, except Constance, Michael, and Billie Dean. If you’re a little fuzzy on what exactly happened in the third season finale, you’re not alone. Nearly every dang character dies and comes back to life in some fashion. After Fiona (Lange) dies from cancer she remains trapped in her own personal hell alongside the Axeman (Danny Huston). The girls of the coven undergo the Seven Wonders test to determine the next Supreme. That’s the episode that became a Stevie Nicks music video – and guess what, she and her shawls are coming back for Apocalypse! Where Does Michael Fit in With the Coven World? One theory for the new season is that Fern’s Michael will join the witch academy. 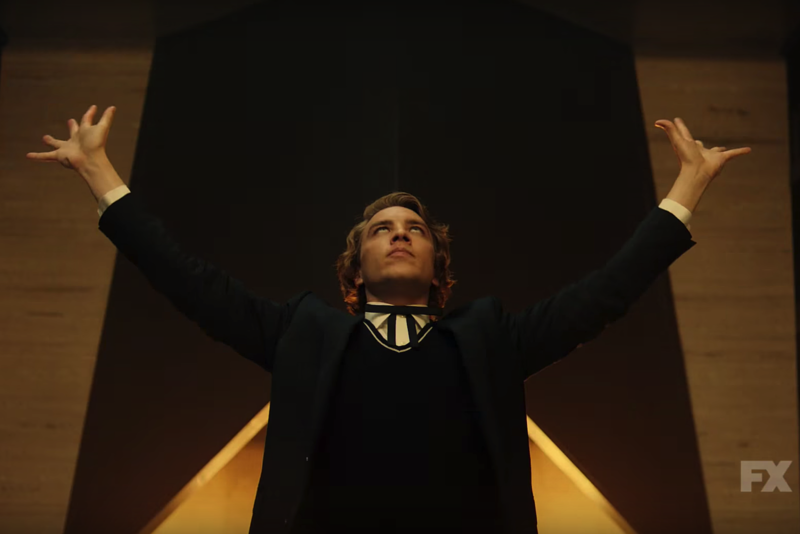 Last year, Murphy teased that a character from Season 1 would be “thrust into the world that you are left with at the end of Coven, which is sort of like the male/female/witch academy.” Surely the Antichrist knows some spooky tricks that will grant him access to the school. The latest footage seems to confirm it. Fern’s Michael is seen wearing the same outfit – a black blazer, white shirt, and skinny black bowtie – that other boys seen behind Cordelia inside the academy are wearing. Who’s Returning and Where Did they Leave Off? Lange will finally return for the first time since Freak Show to reprise her Constance, likely alongside Fern’s Michael. Last we saw, she was raising Michael in her home next door to the Murder House. The entire Harmon family will be back with Britton’s Vivien, McDermott’s Ben, and Farmiga’s Violent (remember, all ghosts). 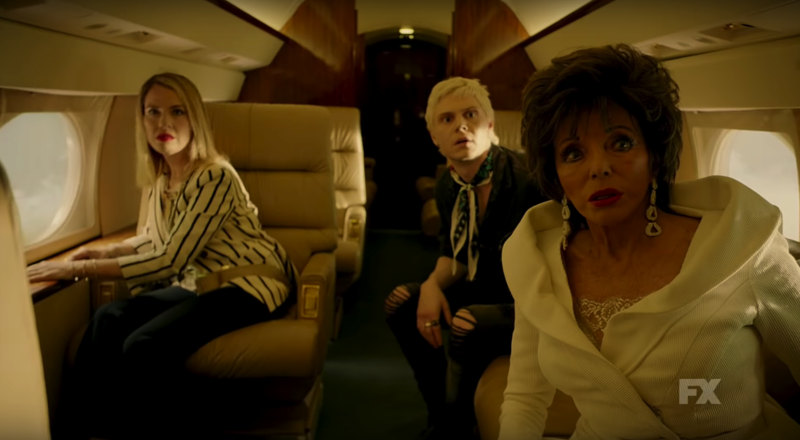 Peters is playing two roles this year: he’s reprising his Tate, while also playing a new character, a blonde hairdresser you can spot in the new teaser who’s also the grandson of Joan Collins’ mystery woman. Paulson is playing three roles: reprising her Billie Dean Howard and Cordelia Foxx, while playing a third mystery character named Venable, who we may have had a look at in a recent teaser. Surprise, b—! Roberts’ Madison Montgomery is back (from the dead … again). Frances Conroy is returning as Myrtle Snow, who was technically dead at the end of Coven – she was burned at the stake, resurrected, then burned again. There’s no word on whether her Moira from Murder House will return, but at the end her ghost remained at the home with the Harmons. Lily Rabe’s Misty Day will be back from Coven, even though she died and turned to dust at the end of the season when failing the Descensum test of the Seven Wonders. Her Nora Montgomery ghost remained at the Murder House where she became a little obsessed with Vivien ghost baby, but there’s no word on whether she’ll return. Perhaps the show will solve one fan theory that Nora and Madison Montgomery may be related. Gabourey Sidibe’s Queenie is back, as teased in a set photo. While she ended Coven safe and alive on Cordelia’s witches council, you may remember her grisly death in Hotel. In that season, Queenie was killed by Peters’ Mr. March and Angela Bassett’s Romona Royal. Again, death means nada in this universe! Sadly, Angela Bassett won’t be back for the new season. Kate Mara’s Hayden was still around as a ghost at the end of Season 1, but as far as we know she won’t be back. Kathy Bates is back as a new character named Ms. Meade, seen hailing Satan with Michael in the trailer. We likely won’t see her Delphine LaLaurie, who was murdered and sent to hell by Queenie in Coven. Adina Porter has played characters in Murder House (Ben’s depressed patient Sally), Roanoke and Cult, but this year she’s an all new character named Dinah Stevens. Other AHS returners include Billie Lourde as a woman named Mallory (you can spot her, Leslie Grossman as a woman named Coco St. Pierre-Vanderbilt, and Billy Eichner, Cheyenne Jackson and Billy Porter in unknown roles. Newcomers include Jeffrey Bowyer-Chapman of UnReal and Kyle Allen of The Path. What About the Dante’s Inferno Theory? There’s long been a popular fan theory that every season of AHS represents a different circle of hell from Dante’s Inferno poem. Check out our video above that breaks down this theory and how it connects to every season. What’s interesting is Murphy shared the theory last year in an Instagram photo that connected the first seven seasons to the different layers. It’s not exactly a confirmation, but it suggests the new season could fill a missing connection. My guesses were a little off according to Murphy’s photo, which suggests the only circles of hell left to explore are Lust and Violence. So will one of those serve as the theme to Apocalypse? AHS has already been renewed for Seasons 9 and 10, so there’s plenty of time to complete the theory. The new season will also feature Paulson and Peters stepping behind the camera to direct episodes. Paulson is directing an episode featuring Lange, as well a sBritton and McDermott. For now, the rest remains a mystery, but hopefully with the new season less than a week away we’ll learn more soon. Until then, prepare for the witches to meet the Antichrist next week. American Horror Story: Apocalypse premieres on September 12.